With the sea of tools available to us on our computers these days, it’s difficult to work out what’s best to use. Few apps are good at more than one thing, driving us to juggle numerous services to achieve our daily tasks, and worse; everyone has their own personal preferences, which means we’re often forced to jump between multiple applications to achieve the same goal. 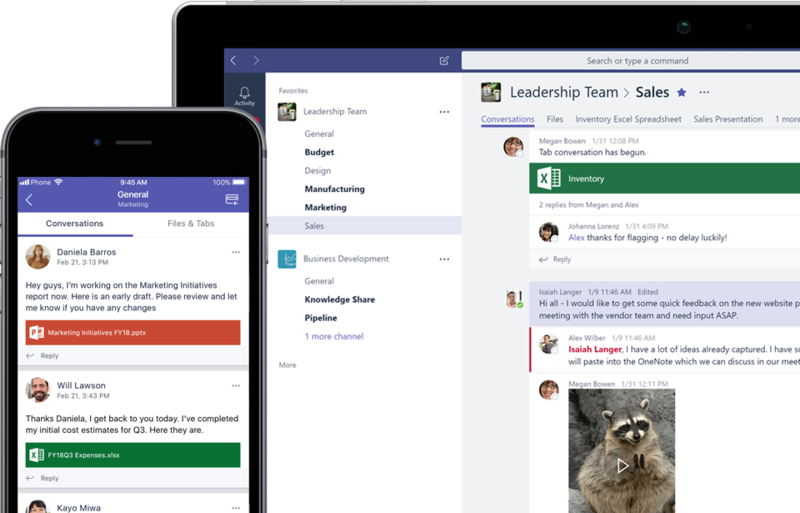 Teams is Microsoft’s answer to a single-pane-of-glass application covering a full range of our day to day communication & collaboration needs. Functioning both internally & externally to your business, Teams cuts out the time that is lost in the fog of numerous third party services, along with the pain & frustration that comes with more traditional team working by older methods, such as email. Do away with endless email chains, being cc’d into emails needlessly, and losing track of the latest file version following multiple versions being passed as attachments between everyone. With Teams, you can centralise the conversation. Every user within Teams, (grouped into individual Team groups on a project by project or departmental basis), can refer to the “Conversations” pane for that specific group. Just like the feature we’re all familiar with on social media platforms, users can be tagged (i.e. @John Smith), to ensure they are alerted to a point of reference within the conversation relevant to them. Files, images and videos can all be shared and embedded into this conversation stream. The history can easily be searched from the bar at the top, and importantly all information is viewable on any device in a matter of seconds. Save hours in trawling your Outlook mailbox trying to find that specific conversation from months earlier. Beyond the chat stream, your users can collaborate on files live – right within the app. Microsoft Office Web Apps are supported right within Teams, so you can have numerous team members, (both internally and externally to your organisation), working on the same document, at the same time. You can literally see your colleagues entering information to the same document right in front of you. Prefer a quick chat over the phone? Text-based instant message conversations are great, but prefer to have a quick voice chat instead? No problem, Teams has that covered too. 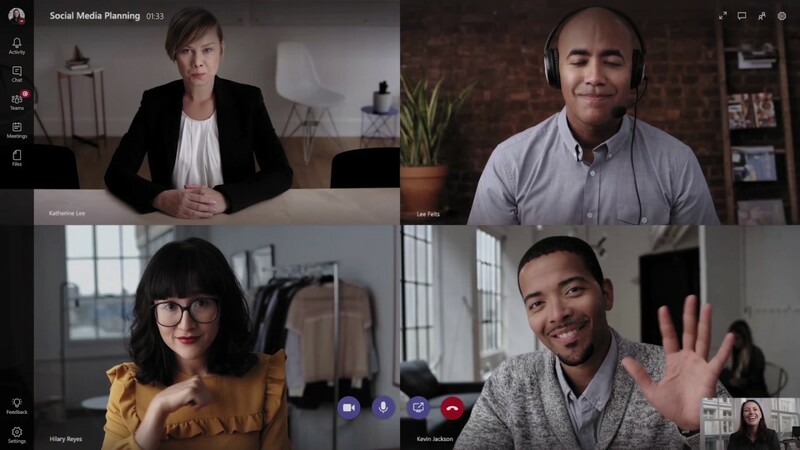 Built from the foundations of Skype, within the very same Teams application (on any device), you can access voice & video conferencing between one or multiple users. Calls can be setup on the fly or pre-scheduled – if you use an Outlook calendar, you can create a Teams appointment just like any other calendar entry. The invitation creates a web link button to join the meeting within the details of the Outlook calendar appointment. So whether you are inviting colleauges, clients or suppliers to a call – with one click, they can join the meeting regardless of whether they are Office 365 or Teams users or not. Those non-Teams users won’t need to download software or go through a long-winded setup. They can join the call from their favourite web browser and simply have at least a microphone, (and webcam for video), active on their device. At the same time of calling, you can be sharing desktop screens or access the same Office file via the cloud and work together as though you’re sat in the same room. If you are swimming in a sea of far too many options and are considering consolidating, Teams might well be the best answer. At iTeam, we take a consultative approach to working with our clients. Unlike the majority of IT providers, we take the time to learn our client’s business, operations and processes; enabling us to better tailor workable technology solutions. If you are considering migrating to the Cloud, use Office 365 but not to its full extent or need guidance around technology solutions to your operational problems – please get in touch. For over 14 years we have partnered with clients across Bristol, Bath and the wider-South West as their outsourced IT department – covering all needs from IT Support, to Cloud, to Connectivity and Communications.